KnowFlow is designed for environmentalists who want to monitor water quality and get real time data. It can monitor 2 parameters with basic kit: pH and Electronic conductivities. The kit is based on Arduino, easy to change and add more sensors and modules. Currently it stores the data on a micro-SD card, also the data can be viewed on your smart phone via Bluetooth communication. KnowFlow AWM (Automatic Water Monitor) is the first kit for Open-Source Science in KnowFlow team. KnowFlow team comes from NGO GreenSeed Organization. We are going to build a low-cost water monitor for the people who join the course. Then we found that a lot of people need the water monitor, so we release all the things to help people make themselves water monitors. Using the water monitor, you can find the water quality by real time, also you can store the data into the TF card, analysis the data. It can be using on environment study, pollution sourcing and teaching ets. KnowFlow team focuses on the solution of environment and agriculture problem. We can provide best tool by using hardware, software, courses and cloud technology. We can support scientists, students, citizens and environmentalists to using the Digital Technology at application in environment and agriculture. We want to promote the development of the Open Science and Open innovation by this efforts. 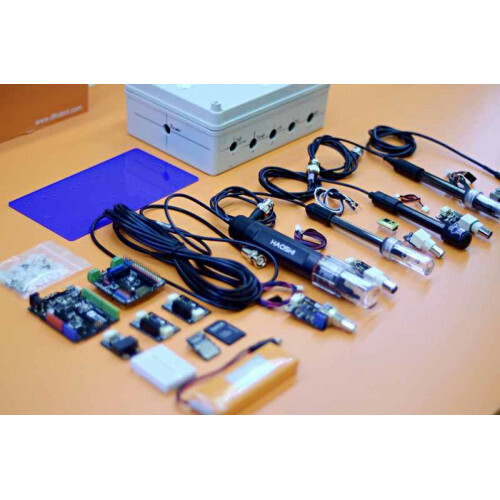 KnowFlow Kits is using the DFRobot Gravity Sensor series. Gravity Sensor series are easy to use and high compatibility. If you are not care about the code, you can just upload the sketch into the Bluno board without any coding job. After that you can find that the data is storing into the TF card. KnowFlow can be powered by power bank or Li-po battery. For the advanced function, you may add ORP sensor, and Dissolve Oxygen sensor in your kit. You can find the courses video which is made by GreenSeed and MushroomCloud makerspace. As a basic version of KnowFlow, this Kit is just INCLUDE pH and EC sensors. You may check Gravity: Waterproof DS18B20 Sensor Kit to enable temperature measuring function. We will recommend using a 200mmx150mmx75mm waterproof case and a acrylic plate to mount KnowFlow sensors. You can find the dwg in GitHub.